Building upon the momentum of 2018’s wildly popular Gears of War: The Rise of RAAM comic book, IDW Publishing and The Coalition® are thrilled to announce the upcoming March release of Gears of War: Hivebusters #1, the first pulse-pounding chapter in a five-issue storyline. Written by returning Rise of RAAM author Kurtis Wiebe and featuring the artwork of Alan Quah (Dark Souls, Quake Champions), Hivebusters introduces a fearless new squad, racing headlong into a conflict like none you’ve ever seen! After successfully busting a Swarm hive on the remote island of Pahanu, this suicide squad will face their most dangerous mission yet — going after the Swarm that decimated the home settlement of one of their own! “Expanding the lore of Gears through comics allows us to introduce our fans to new characters and new stories, while also reaching a new audience with our partners at IDW. Following the success of Rise of RAAM, we’re thrilled to have Kurtis return and to welcome Alan into the Gears family with Hivebusters, as their combined talents will help to craft a deeply personal and perilous adventure from an entirely new perspective. I can’t wait!” says Rod Fergusson, studio head at The Coalition. Set on the fictional planet of Sera, the Gears of War series charts the story of humanity’s struggle against an army of monstrous, fearsome, and brutal adversaries through a captivating tale of hope, camaraderie, and survival. Building on the success of the third-person shooter franchise that defined HD gaming, Gears of War is expanding with new and unique experiences developed specifically for console, PC and mobile devices. With The Coalition and franchise co-creator Rod Fergusson leading development, Microsoft Studios is tripling down on Gears of War with three new titles: Gears 5, Gears Pop!, and Gears Tactics. Published by Microsoft Studios, the award-winning and billion-dollar Gears of War franchise has continued to redefine the third-person shooter genre. Launched to critical acclaim in 2006, the franchise has inspired a full line of toys and Funko collectibles, apparel and a series of graphic novels in partnership with IDW Publishing. In October 2016, Universal Studios announced that it had optioned motion picture rights to the Gears of War franchise. 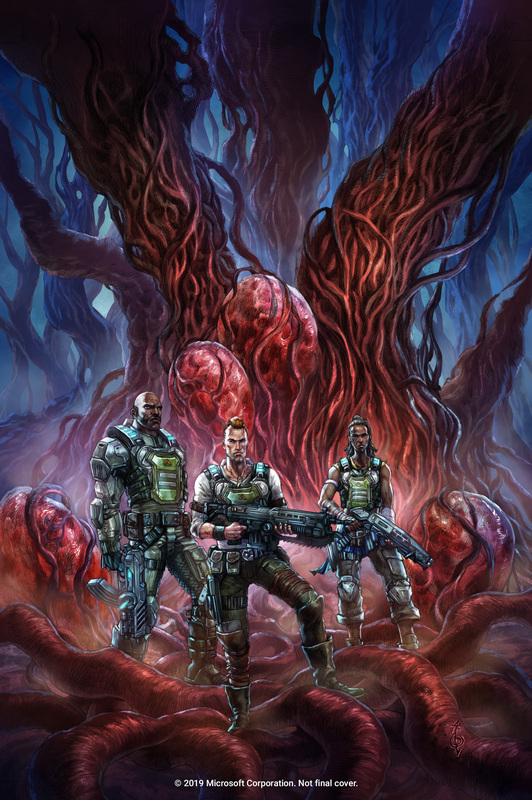 For information on how to secure copies of the Gears of War: Hivebusters series, please contact your local comic shop or visit www.comicshoplocator.com to find a store near you.